Audi has revealed the updated 2019 R8 sports car; it will come in both coupe and Spyder versions. For the 2019-year model, the car has been updated with new style and for more performance. Audi will offer two versions of the V10 engine in the R8, but exactly what sort of power output those engines will have is unannounced. We do know that the 2019 R8 shares 50% of its parts with the R8 LMS GT3 racer and 60% with the R8 LMS GT4 racer. 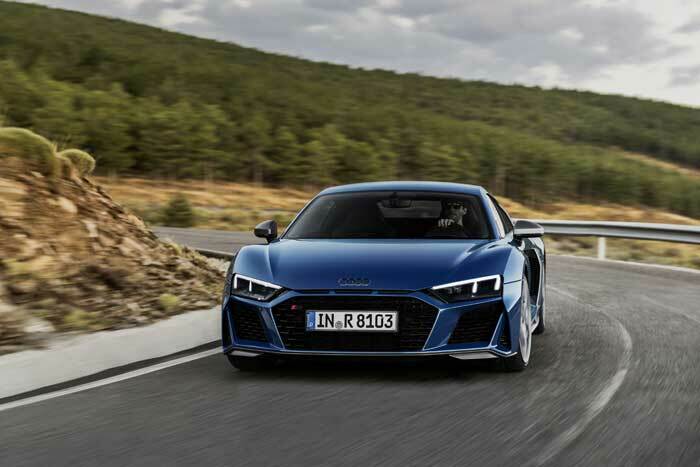 Audi says this makes the 2019 R8 the closest automobile to its motor racing siblings on the market. The V10 engines will use a dry sump oil system with a separate oil cooler to keep temperatures down. Audi also updated the suspension for betting handing and the 2019 R8 will have available dynamic steering. Depending on the version purchased, Audi offers drive select modes of dry, wet, snow, and performance. The stability control system was tweaked to improve stopping distances significantly. The front and rear of the car have been redesigned, and options now include a CFRP and aluminum front stabilizer and ceramic brake rotors. The car will go on sale in Europe in early 2019; pricing is undisclosed.